Modern, digital repeaters offer many benefits for those who use them. They deliver extended range, multi-site linking, increased system capacity and enhanced privacy and security features. A two-way radio repeater is a piece of radio equipment that receives weak radio signals, gives them a boost and transmits them back out, all simultaneously; like a megaphone for radio waves. Since radio range is restricted by line-of-sight, repeaters are usually placed in the highest possible area, like the top of a mountain or building, to maximize the range achievable by handheld units on the ground. To understand how repeaters work, you must understand a little bit of radio technology. Radios operate in either Simplex or Duplex modes. Simplex is simple, radio-to-radio communications where only 1 transmission can be sent at any given time because only 1 frequency is being used. 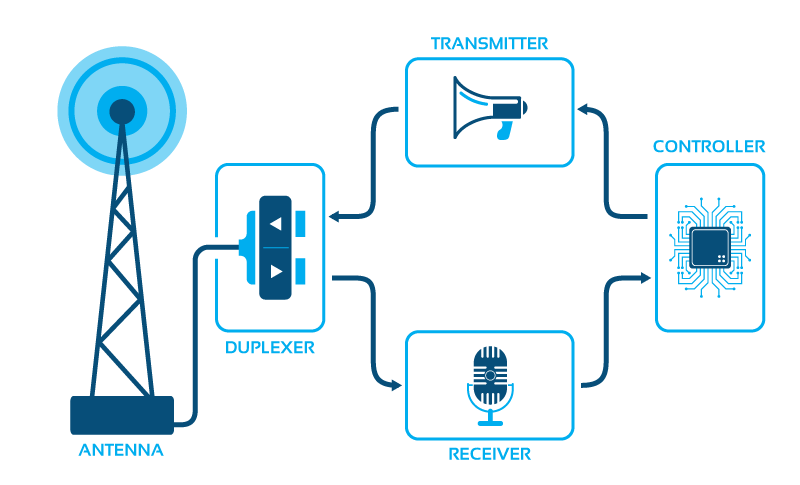 In Full-Duplex, two-way radios can transmit and receive at the same time, similar to how a telephone conversation works. Duplex mode uses 2 frequencies, one for transmitting and one for receiving, which allows a portable radio to perform both functions at once. Repeaters use Full-Duplex technology to receive a signal on one frequency, give it a boost in power and transmit it out on a second coordinating frequency. All of this is done simultaneously, similar to how a megaphone instantly amplifies your voice, a repeater instantly amplifies your radio signal. Giving much greater range to your portables and mobiles. Antenna - Should be mounted as high as possible, like on the top of a mountain or building, for maximum line-of-sight. Meaning, you will get the most range and coverage possible. Only one is needed if you are using a repeater with a duplexer. Duplexer - Filters and separates the signals coming in and out of a single antenna. Keeps the boundaries between transmitting and receiving frequencies from becoming desensitized. Receiver - Picks up incoming radio signals. Has to be very sensitive to catch the weak radio waves. Controller - The brains behind the operation.This little computer controls the entire repeater - station identification, transmitter activation, autopatch, etc. Transmitter - Very powerful! Sends signals back out with a tremendous boost in strength. 2 options for operations: intermittently, or the preferred, continuous duty. Conventional and Trunking are the 2 main repeater system types you have to choose from. A conventional system has set channels that frequencies are assigned to. You may assign one channel to maintenance, one to security, and the others split between the different departments. However you decide to organize it, it is set and stays exactly how you have it programmed. Conventional is the ideal system if you have a smaller number of users that have a well-defined communication protocol and network, and have definitive talk groups. With Trunking, frequencies and channels are shared as they are needed. One channel is always designated as the control channel, and it determines and assigns channels for users to transmit on when they key up their radio. Once their conversation is finished, that channel is then made available for the next user. This allows for greater system capacity because it provides a more efficient use of the radio frequencies. Instead of a frequency being set for one particular group to use when they need to communicate, it is open to all, and since users are not sending voice transmissions on a given channel 100% of the time, it allows for more users to be added to the system. Trunking is a perfect fit for large organizations that need to communicate between many departments and for those who need to transmit to multiple sites. What Can a Repeater Do For You? 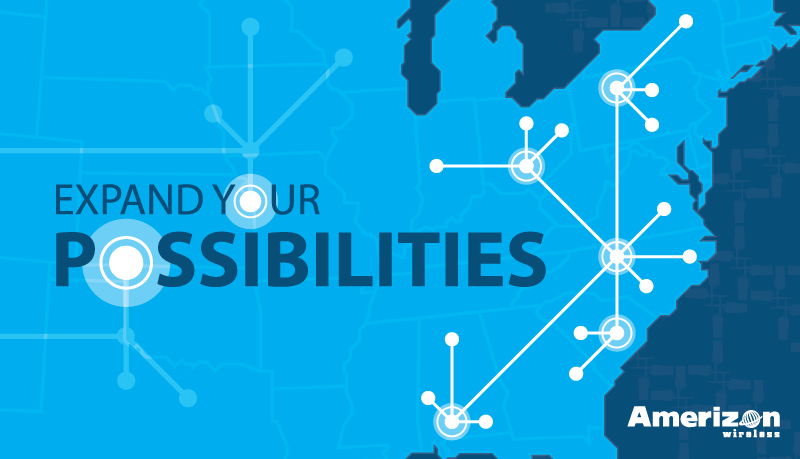 Repeaters can help your business in many ways. We have already mentioned how they increase your radio range by picking up radio transmissions and sending them back out with a powerful signal boost, letting them reach further. They also help with range, by helping to overcome obstacles that block the line-of-sight needed for effective coverage. Placing a repeater on the top of a hill or building can allow radio transmissions to travel over the obstacle via the repeater. 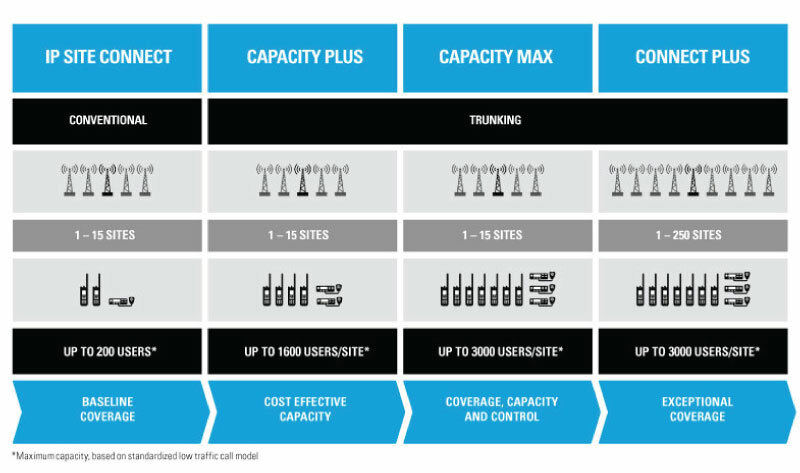 We have also mentioned previously how a Trunked Repeater System can give you extra user capacity, by implementing shared channels instead of set channels. Meaning a more efficient use of the frequencies and more radio users on the system. Repeaters can also link multiple sites together. Let’s say you are a commercial contractor and you have many different job sites to manage that are spread out further than the range of a standard portable radio. A repeater system can connect those sites and allow you to communicate to any or call of your crew members from anywhere inside your radio system. Turning your standard portable, into a long range two-way radio. Repeater systems also mean enhanced security. Motorola’s MOTOTRBO™ systems are designed for the tightest communication security available. Some of their security features include System Access Authorization before allowing a user to hear or send transmissions and Remote Disable and Enable of individual units if they become lost or stolen. Keeping your communications private and your trade secrets confidential.